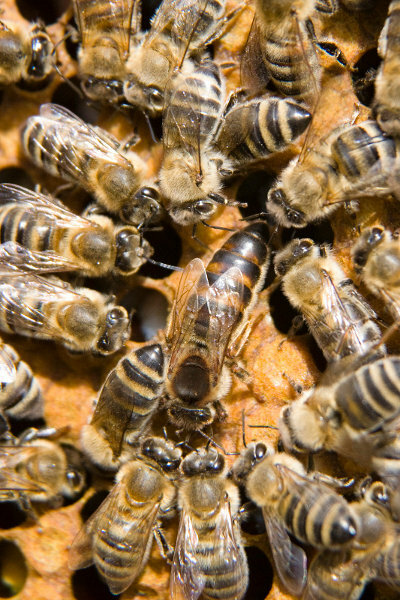 An average hive at the height of summer will contain:- 1 queen, approximately 50,000 worker bees (all female) and a few hundred drone bees (male). The queen is the only sexually developed female in the hive. She can lay up to 2500 eggs a day. The queen lives for about 3 years. Workers live for 6 weeks in the summer and 6 months or more if required during the winter. An average worker bee makes about 0.0005 litres (1/12th of a teaspoon) of honey in her lifetime. A hive of bees will fly 90,000 miles, the equivalent of three orbits around the earth to collect enough nectar for 1 kg of honey. Since the mid 1800's most beekeepers in Western society have used box beehives with removable frames for ease of management. 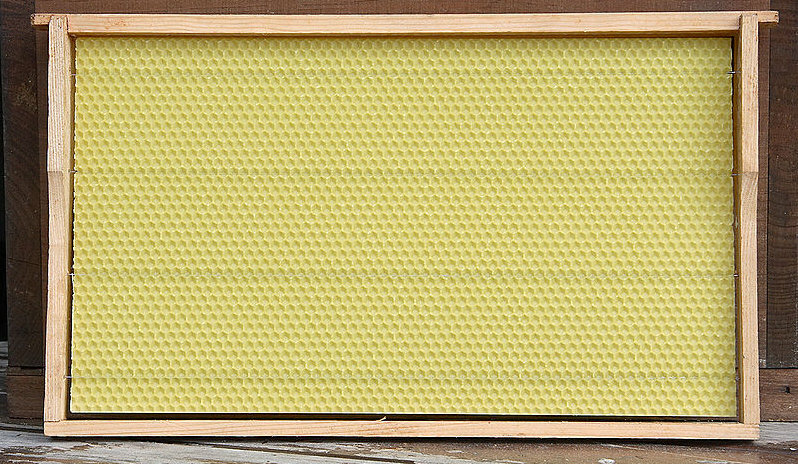 The frames are filled with 'foundation' which is commercially recycled bees-wax stamped with a uniform honeycomb pattern. Here in the UK the National beehive is the most widely used. 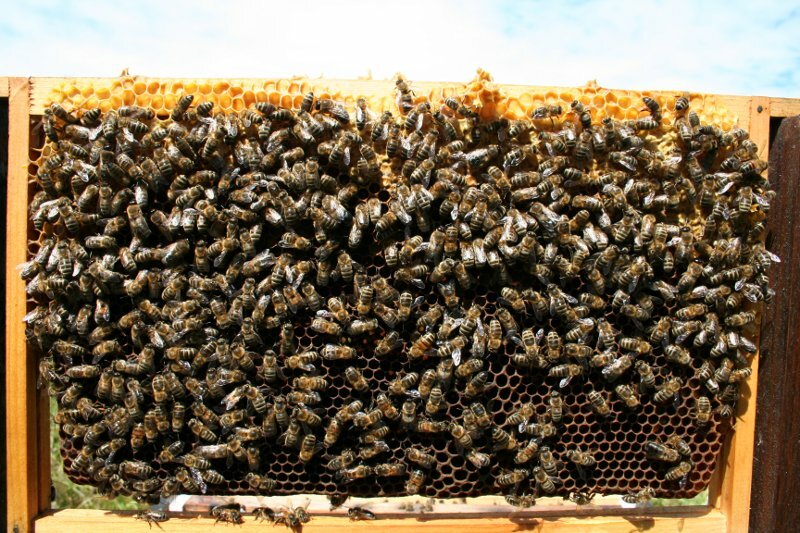 This method of husbandry restricts the most important member of the colony, the queen, to a large 'brood' box at the bottom of the hive with honey being stored in a number of smaller boxes that are added one upon the other on top. The queen is not only restricted to one area but is often marked on her thorax with a dab of paint so she can be seen easily and sometimes has her wings clipped so she cannot fly. Generally the honey is harvested in late summer, but this can also be a difficult time for bees as the flow of nectar is particularly low, so it is general practice to feed the colony with a sugar solution, which they then convert into honey for their winter stores. Commercially made beeswax foundation with uniform sized cells. 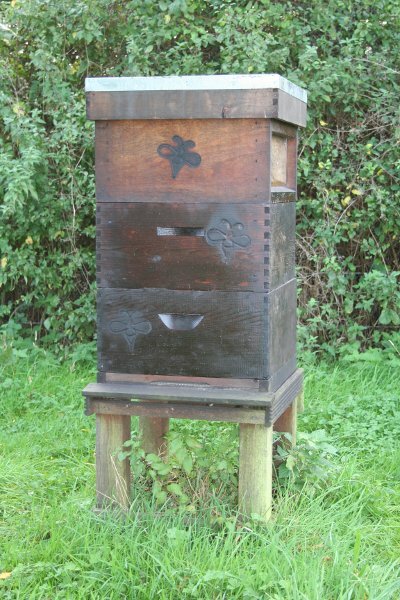 I use the National hives as mentioned above but with a number of changes to the way they are used. 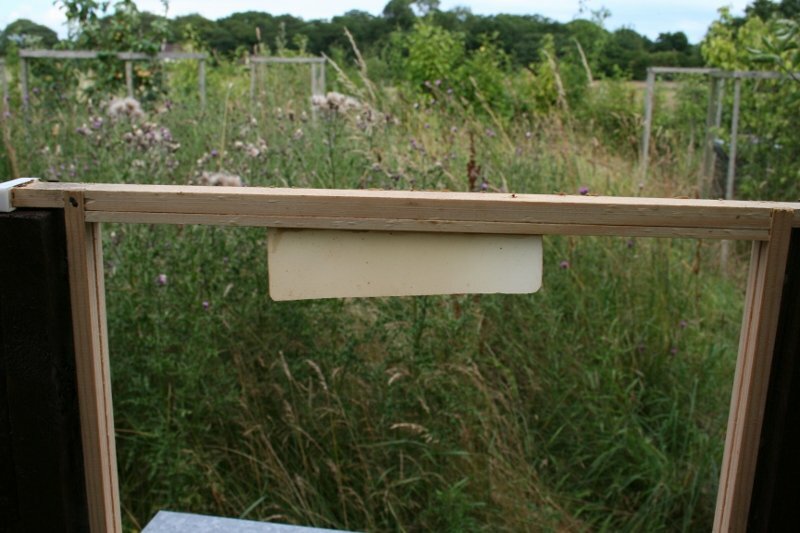 Only the larger 'brood' boxes are used, always placing a box underneath the one that is filled so the bees work downwards as they would in the wild. When the hive has reached three boxes high the general layout inside is:- the top box is full of honey on the oldest wax; the middle box is a mixture of young brood and nurse bees with honey stores and the bottom box is the cleanest/newest wax with mostly brood, pollen and stores. The queen, who is unmarked and not wing clipped has access to the whole hive. Now for the good bit, at the end of the winter, as long as there is plenty of nectar and pollen being brought into the lowest box on the hive, I can harvest what is left of the wonderful flowery honey from the top box. Hopefully the bees won't even notice that it has gone! I do not use 'foundation' preferring to let the bees build their own comb from scratch. Letting the bees get on with their own house building ensures clean, pure wax. Beeswax absorbs medicines and chemicals used by beekeepers and cannot be removed, these impurities then get recycled back into the 'foundation' sheets ad infinitum. With diseases on the increase I felt that using bought in wax from other people's hives might exacerbate health problems. Also, giving a printed sheet with uniform over-sized cells dictated by humans goes against how the bees would build their comb naturally. As many of you are aware, the varroa mite has been one of the biggest problems to keeping healthy bees over the past 20 or so years. There are a number of medicines on the market for the control of this problem, however, in the same way as humans are gradually building an immunity to antibiotics, likewise the varroa mite is building a tolerance to many of the prescribed treatments. Whilst I accept that medicines are necessary at times I have found that a 'biotechnical' method of varroa control along with open mesh floors for the hives and a once a year organic acid treatment does not eradicate the mites completely, but keeps them to a controllable minimum. Hopefully with time the bees will learn how to deal with this problem in the same way as their Asian cousins have. Over the past 6 years I have slowly adapted to this style of keeping my girls. I am very pleased with the simplicity of it and the fact that my bees are as natural as is possible but with the advantages of being able to inspect the hives easily for disease and problems if necessary. If gentle and easy to manage bees are anything to go by, then my colonies are also happy with this method. The down side though of allowing the bees to build their own home is that I get less honey than the 'conventional' method, but more wax as the whole comb is harvested when I collect honey. The honey is gorgeous (I might be biased) and enjoyed by many, whilst the wax is saved and during the winter months I make candles, as many of my friends and family will testify! National hive, 3 brood boxes tall, without queen excluder. Her royal highness the Queen bee... Home reared this year. 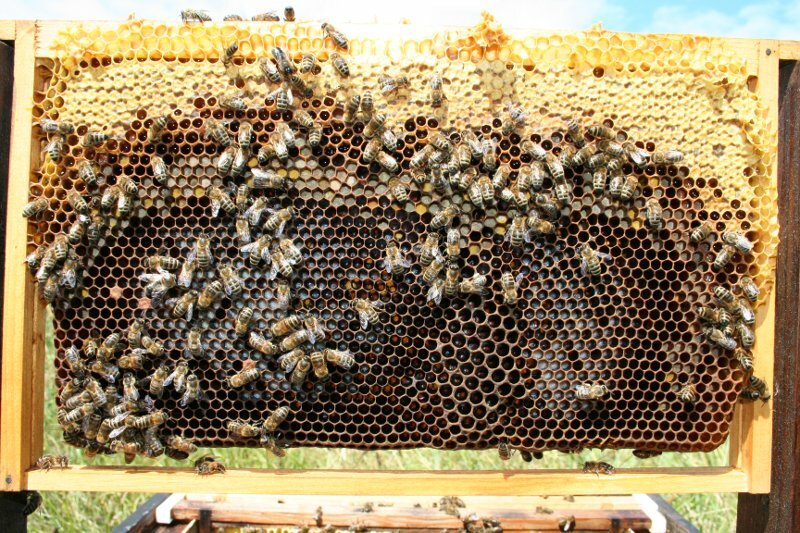 This picture shows a frame of natural comb covered in bees. Natural beeswax formed by the workers. Notice the different size cells this frame has. From the top:- sealed honey stores, pollen (yellow and white cells) and lots of very young brood (the milky white cells). The large cells (centre right) are for drone bees.